My co-worker and fellow editor Jackie had raved about photographer Seth Casteel long before we ever published his photos in Dogster magazine. This was back when Jackie and I worked for a publishing company out of California and Seth was an up-and-coming California dog photographer. I remember that’s how I first heard about him. And then, I heard about him some more because he didn’t stay an up-and-coming photographer for long as he soon found national success with his books — Underwater Dogs, followed by Underwater Puppies and Pounce. Today those books sit on my bookshelf in my office. The Pounce book — about cats, course! — is signed because I actually got to meet Seth later, after he did a couple of covers on Dogster and after I left California, when we both were at a Bark World pet conference. I have to say, truly, that one of the perks of my career has been all the pet photographers I’ve known over the years. They are really a great group of people and I wish I lived closer to many of them so we could hang out more. Seth was no exception. His clothes and hair announced his artistic flair, he was way more fashionable than most of us there. He was really genuine with a great sense of fun and a personality that shined. It’s not a surprise that he’s now the host of a television show, particularly one about dogs looking for homes. The premise of Finding Fido is simple — making the perfect match between humans and dogs. Seth takes people looking for a dog and introduces them to dogs looking for a home. For example, in Season 1, an active man named Matt with type 1 diabetes went to Seth for help finding a companion dog who could also possibly become a certified diabetic alert dog. At the end of the episode, the humans are matched with pups that best fit their lifestyles and needs. But don’t worry, the dogs not chosen find homes too. You can find out what happens to them at Z Living’s website, zliving.com. What’s Z Living? Cable company Z Living’s programming focuses on fitness, health and food, and other fun lifestyle topics, like pets! If you don’t have the Z Living channel, you can still watch the shows On Demand by streaming them to your preferred watching device. Finding Fido airs on Sundays at 8 p.m. EST on the Z Living channel. 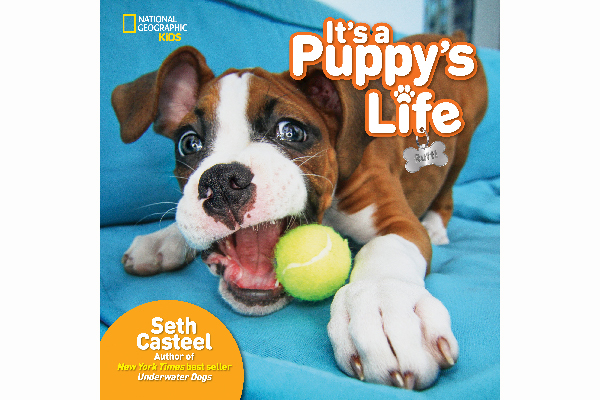 Seth’s new book, It’s a Puppy’s Life. Seth just wrapped his second season of Finding Fido. (If you missed it, you can still watch it On Demand and stay tuned for next season.) We got a chance to ask Seth some questions about the show and other projects he has going on. DOGSTER: How did you get involved with Finding Fido? Seth: In 2007, I began volunteering with Los Angeles animal shelters as a photographer, taking pictures of adoptable dogs and cats to help them find families. Since then, I’ve had the opportunity to photograph adoptable pets all over the world and teach photography workshops to shelter and rescue staff and volunteers. For me, Finding Fido is really just an incredible way to continue that work with a larger audience. I believe in a positive approach to educating others about animal welfare, in particular rescue and adoption. Finding Fido is exactly that! We are able to match adoptable dogs with families, while at the same time, providing insight to viewers at home about adoption and what kind of dog might be a great match for them and why. What has surprised you the most about your experience with Finding Fido? How emotional this experience has been. I have the opportunity to really get to know our adopters and the dogs, so each episode [is] personal for me because I’m seeing dogs literally be saved and humans evolve into even better versions of themselves because of these dogs. How do you think the experience has changed you? I’d like to adopt a second dog! I’ve been thinking about it for a while, but after filming season 2, it’s just always on my mind! I also know that my rescue doodle, Nala, would enjoy a pal to lounge around with on the couch when I’m out bopping around for work. Also, the show reveals to all of us the many exciting and innovative ways that dogs can improve our lives as human beings, especially regarding our mental and physical health. Dogs truly are humans’ best friends! Is there any dog’s story that touched you in particular? Every episode is special to me for different reasons, but this season, I really connected with Antoinette and Neveah. They are a wonderful family and the addition of a dog to their home was so special and important to them. The dog they adopted was a perfect fit!!! How did you come up with the idea of doing your new book It’s a Puppy’s Life? I was chatting with some puppies and they were telling me that it would [be] a lot of fun to team up on a book about their daily shenanigans! You can check it out here — It’s a Puppy’s Life. Any other upcoming projects you want to share with the Dogster audience? I’m working on a new book project that I’m super excited about! I’ll give you just one guess what the subject of the book is! Hint: It’s not about people. I’m also going on an Underwater Dogs Tour this summer! I’ll be visiting quite a few cities across the U.S., so if you have a water-loving dog who loves to chase a ball, give me a shout! If you like silly pictures of dogs and cats, you can definitely check out @SethCasteel on Instagram or at my website — SethCasteel.com. And also, you can follow my work on Finding Fido Sundays at 8 p.m. ET on Z Living, or Live on Demand through GO.zliving.com. The post Dug Up at Dogster: Seth Casteel Hosts TV Show ‘Finding Fido’ appeared first on Dogster.